Dodge revealed their new 2016 Charger Pursuit police car today, and the big takeaway is: it gets an enormous screen so you can keep your chunky computers in the trunk. 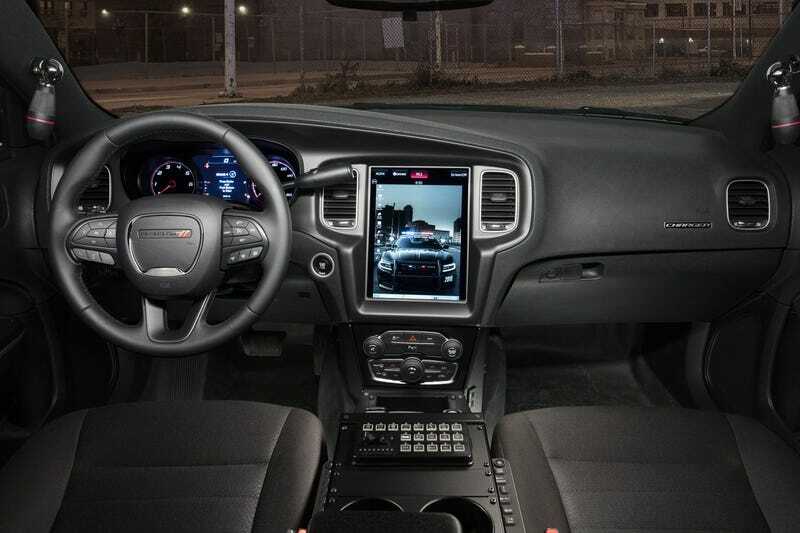 But what it does get is a giant 12.1-inch Uconnect fully integrated touchscreen display, and that’s big news for officers who have been complaining about the Charger’s lack of interior room since it came out in 2006. This means officers can eat more donuts without worrying about outgrowing their cruisers. Instead of housing a laptop on the dashboard in the path of airbags — a safety concern — the integrated touchscreen allows for laptops and other computers to sit on a shelf in the rear of the car. The shelf slides fore and aft and can be locked in one place. Computers can be fastened to it to keep them from flopping around. According to Detroit police Chief James Craig, this integrated 1024 by 768 pixel screen not only gives offers more space and safety, but it makes their jobs easier, as they can do lots of stuff like communicate with dispatch and order donuts all on the same screen. Okay, he didn’t say that bit about the donuts. But it was implied. This 12.1-inch screen is not quite Tesla’s 17-incher, but it’s still pretty honkin’. Hopefully it will make its way to the civilian model.